James Whiting, Counsel, Organized Crime Section, Public Prosecution Service of Canada, Vancouver, B.C. • When is more than one Warrant required? • How electronic disclosure is currently handled and how can it be improved? • How does defence counsel deal with large-sized disclosure packages? These speakers of undoubtedly divergent views will discuss and debate the latest crime bills relating to the use of technology. 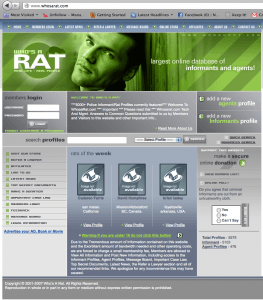 WhosARat.com is an Interesting website that was on the radar of the legal mind at this conference. 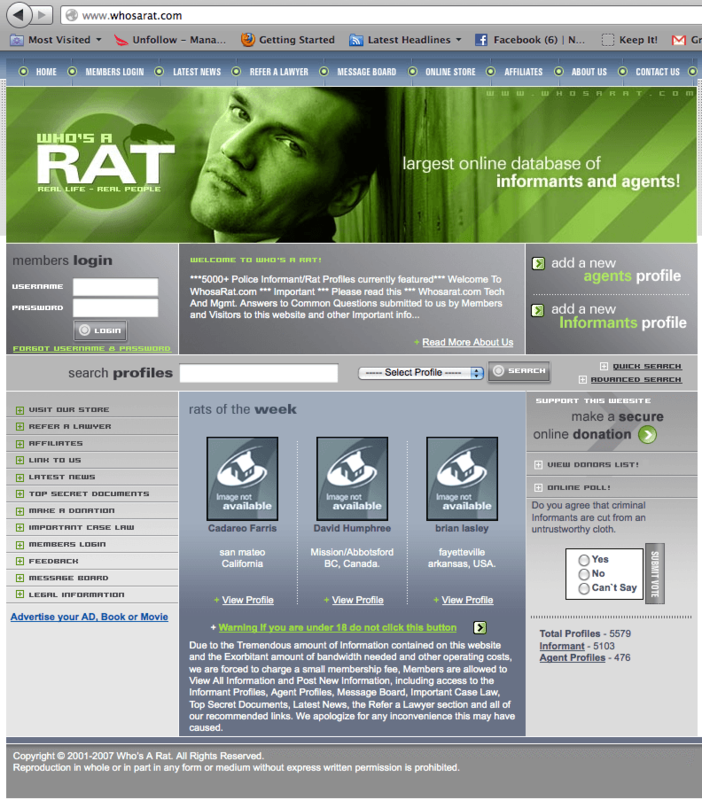 Websites like this essentially ‘crowdsource’ an informant, which has the potential to put people’s safety in jeoprody. 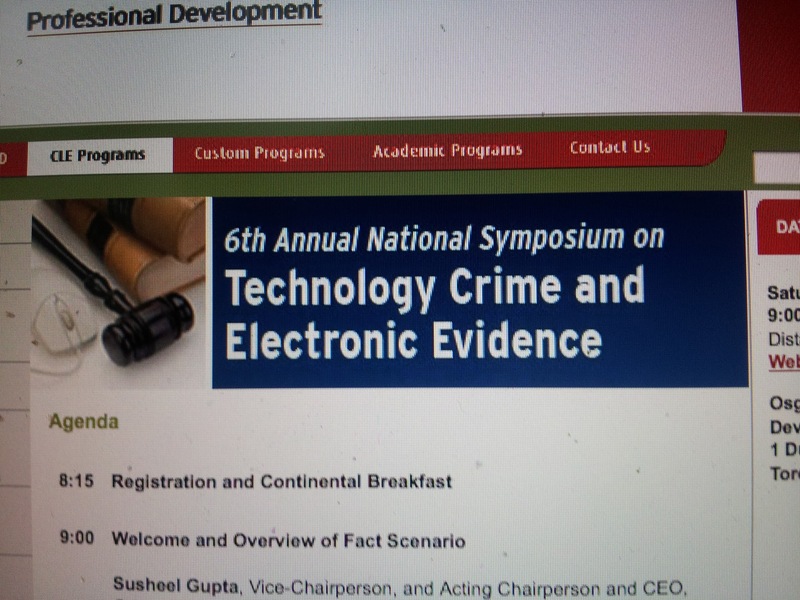 “Roping Off The Digital Crime Scene” is essential for police work in 2012 and the future stated Crime Stoppers International Social Media Adviser Scott Mills at the 6th Annual Technology & Digital Evidence Symposium At Osgoode Hall, Toronto December 2, 2012. 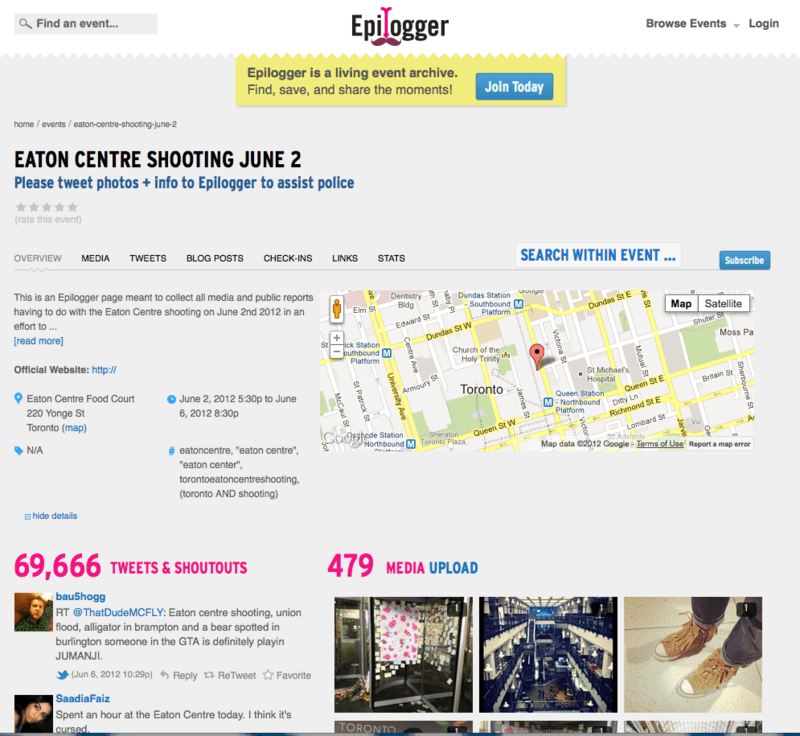 The example of The 2012 Eaton Centre, Toronto Canada Shooting incident was shown to the audience, with over 66,000 tweets plus other online posts sourced on a public event crowd sourcing website called Epilogger, a service founded by Michael Nus and Chris Brooker. Mission of Epilogger is to be the central interactive community for events, ideas and movements. The challenge for police is to be able to capture this potential evidence in a timely manner, sort it, and action the important items as part of the ongoing investigation. This creates additional work for the investigators that requires additional human resources and training. To neglect this aspect of the investigation could result in key evidence being overlooked that potentially could solve a case. The advent of “Crowd Sourcing” capability can also lead police to information that causes police patrol resource allocation to prevent a potential incidence of violence. Question going forward to ponder is Do police use sites like Epilogger for evidence gathering? Do police make their own? Who staffs it? Who pays for the additional costs? How do you separate what is important and what is not? How do you measure effectiveness? The time is long overdue to have the dialogue and work towards solutions. 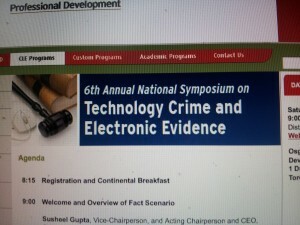 “Roping Off The Digital Crime Scene” is essential for police work in 2012 and the future stated Crime Stoppers International Social Media Adviser Scott Mills at the 6th Annual Technology & Digital Evidence Symposium At Osgoode Hall, Toronto December 2, 2012. 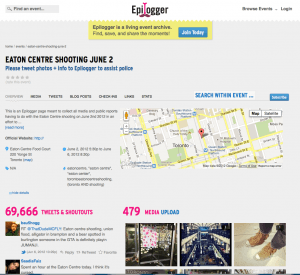 The example of The 2012 Eaton Centre Shooting incident was shown to the audience, with over 66,000 tweets plus other online posts sourced on a public event crowd sourcing website called Epilogger, a service founded by @MichaelNus and @Cbrooker. Mission of Epilogger is to be the central interactive community for events, ideas and movements. The challenge for police is to be able to capture this potential evidence in a timely manner, sort it, and action the important items as part of the ongoing investigation. This creates additional work for the investigators that requires additional human resources and training. To neglect this aspect of the investigation could result in key evidence being overlooked that potentially could solve a case. The advent of “Crowd Sourcing” capability can also lead police to information that causes police patrol resource allocation to prevent a potential incidence of violence. Question going forward to ponder is Do police use sites like Epilogger for evidence gathering? Do police make their own? Who staffs it? Who pays for the additional costs? How do you separate what is important and what is not? 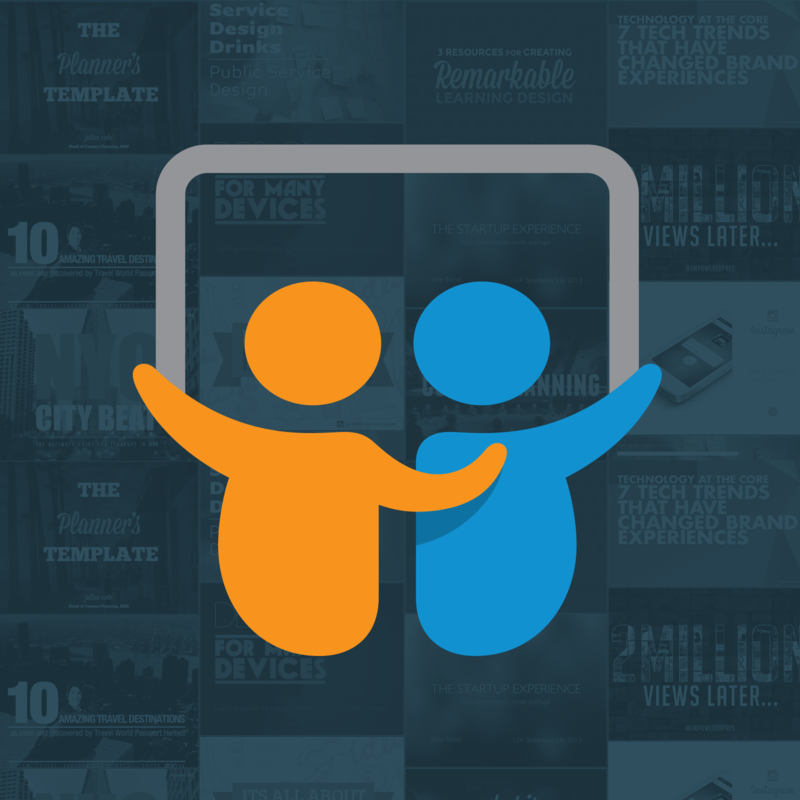 How do you measure effectiveness? The time is long overdue to have the dialogue and work towards solutions.